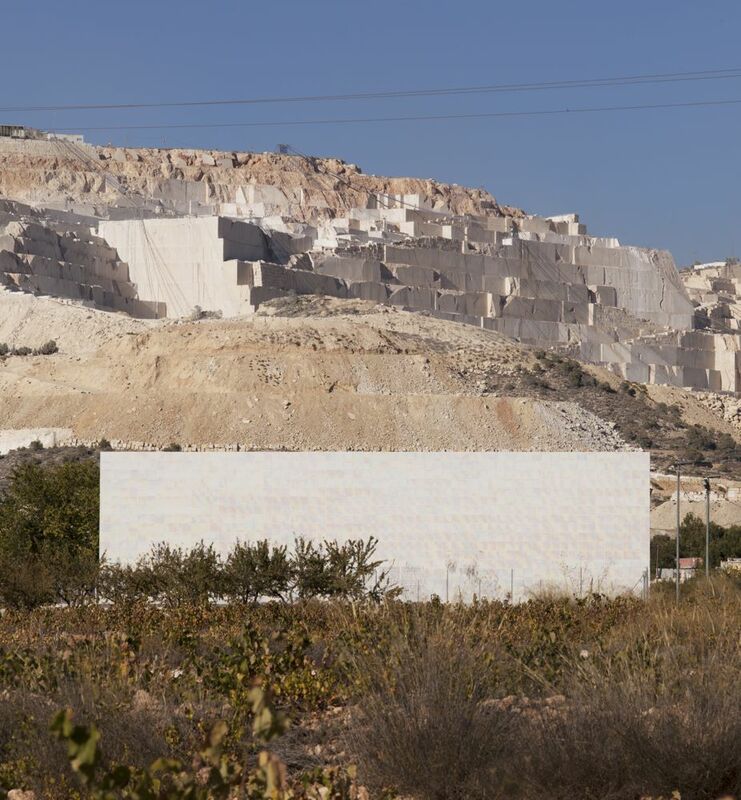 Algueña is a small village in the interior of Alicante County, with a population of two thousand and an economy based in agriculture and marble industries. We were asked for a building able to bring together all the activities related to music and culture that took place in the village, and also promoting its cultural future. We were commissioned to search for an opportunity, articulate it and carry it out. Under these circumstances, that also comprised the definition of an extensive musical schedule of activities and a maximum budget of 562.800 €, we proposed in a first phase the rehabilitation of old Guardia Civil’s quarter that was in disuse since the 80s. That allowed us to have a surface area of 670 m2 that we only had to adequate, and the construction on a new Auditorium of 350m2 and 230 seats. In a second phase, we proposed the construction of a park with an open-air auditorium that will join the village and its zone of future urban development. The responsibility in the approach and the impossibility of failing are important parameters in this kind of villages, where the opportunities come rarely, and there’s no possibility of increasing the budget. That’s why it is very important to construct a complex reality linked closely with the village, and auditing the process with all the agents and citizens involved. The intervention is located in the west entrance to the village, near from classical local wineries, in a city limit that the new urbanistic plan will develop around this plot. 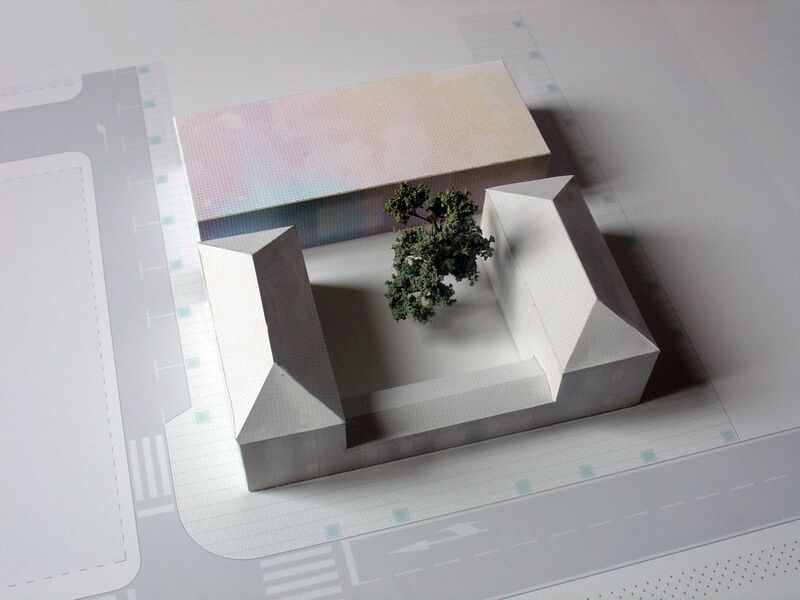 We propose to reserve a green zone beside the building, to develop in second phase an open-air auditorium and a garden with jacarandas, that will have enough entity to separate the new urbanistic development of the existing one, and generating a joining place and giving it ambiental quality. Besides, in the plot exits a building of the 60s, an old Guardia Civil quarters, that is in disuse from years and that has a load-bearing wall structure in good state of maintenance. 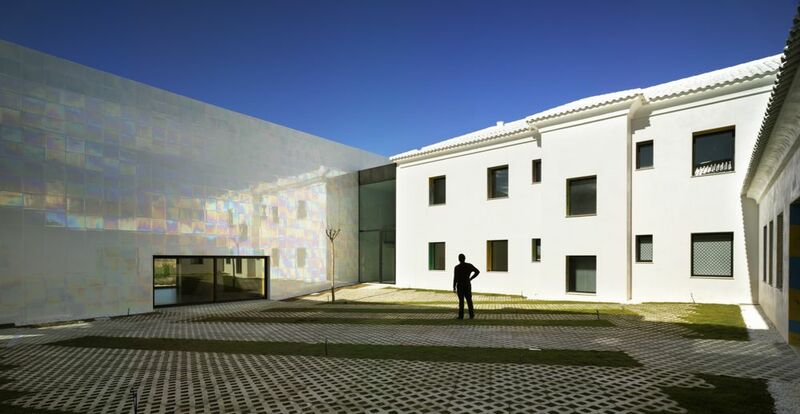 And its shaped in U with an interesting central courtyard for this architectural program. We propose to rehabilitate it for developing that program. 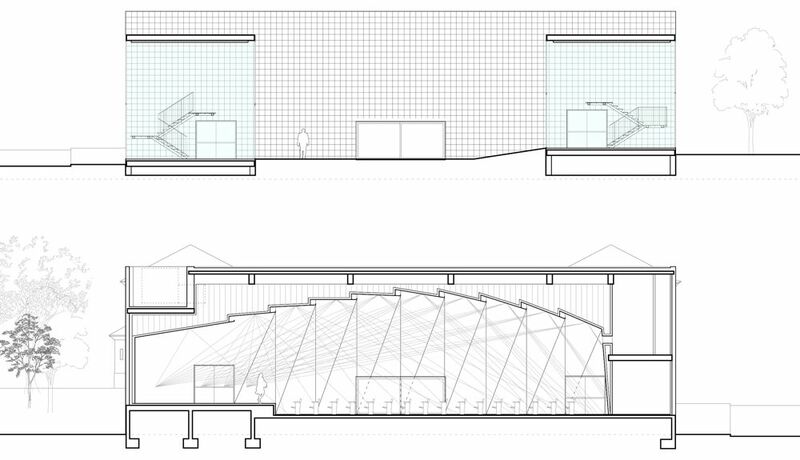 The new construction is separated from the old by new adapted stairs that are enclosed in glass boxes lighted from overhead, that try to add fragility to the rotundness of the whole. 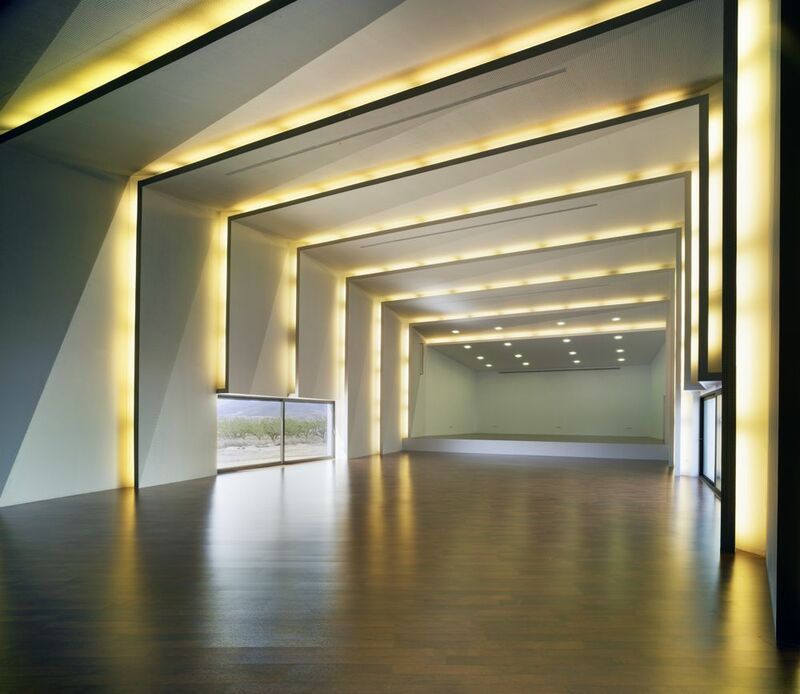 The multipurpose hall houses 230 seats, these seats are moveable and the installations are able to accommodate different kind of functions, from a concert to a new year’s eve party, that’s why it also houses a warehouse where organize all these elements that allow use change. The central courtyard is designed to house the rehearsals of the music band in open-air, or any other kind of functions as award giving parties, etc. without any fixed element. 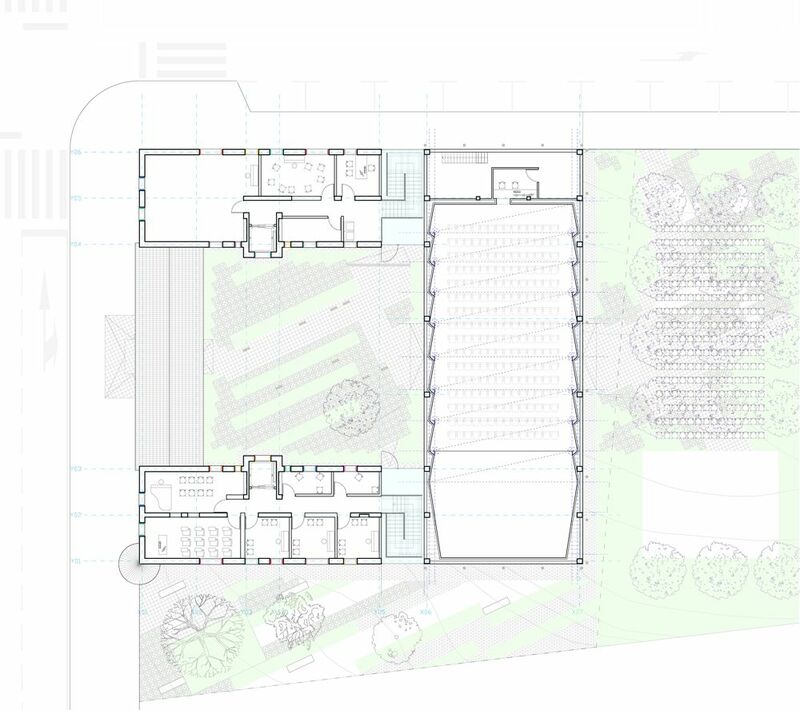 Moreover, it’s designed together with the back courtyard, in which we propose to develop another open-air hall. The intervention has a great potential to be used and we propose more for less. 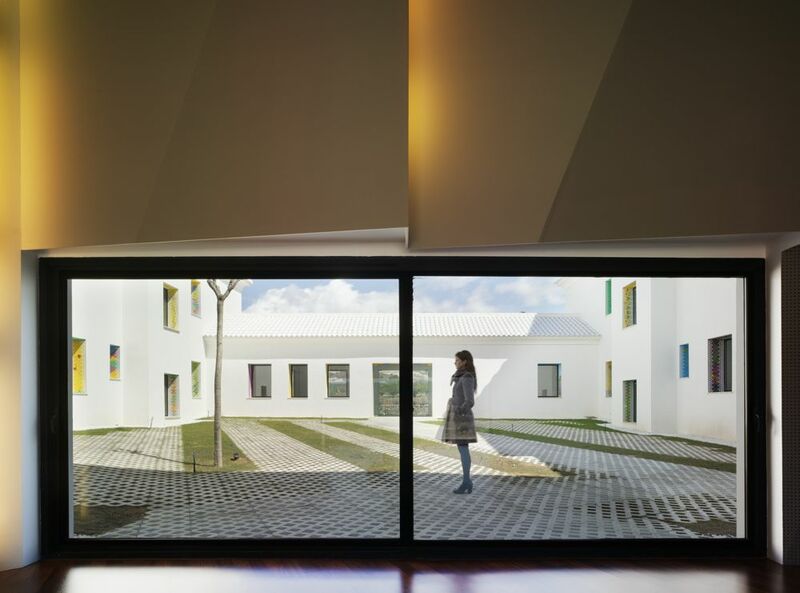 In the existing building we propose the rehabilitation without formal changes. Simply recovering all the old constructive techniques and turning them white with different grades of shine with the intention of generating tension between what the users remember about the building and what it is now, we search for surprise perceptions and the generation of a new surface. 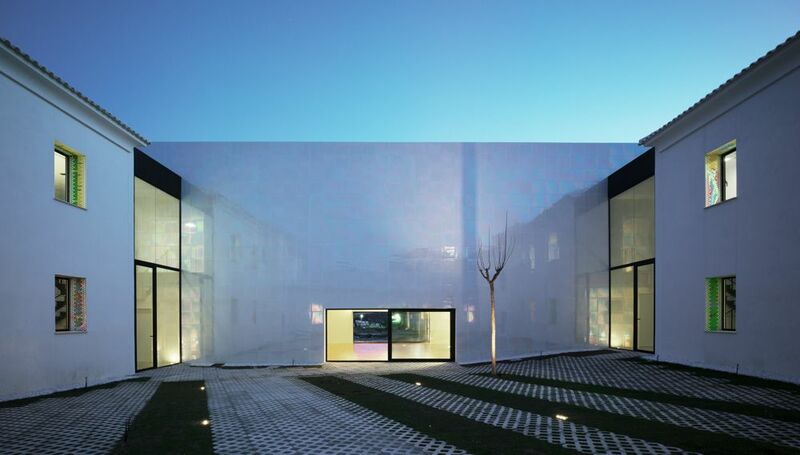 Instead the new hall is a blind box, a strange element because of its shape and dimensions. 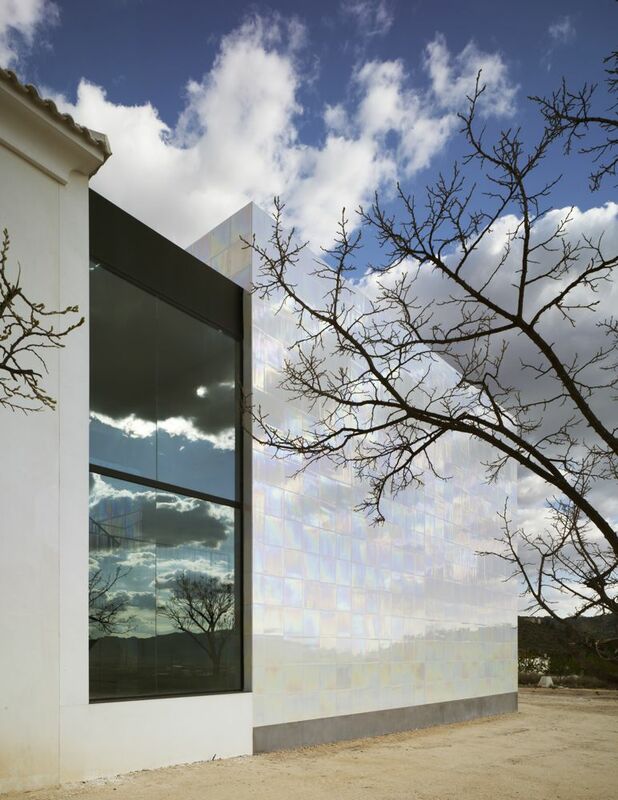 To emphasize this sensation we propose a cladding that vibrates and shines with a pearly-iridescent material. 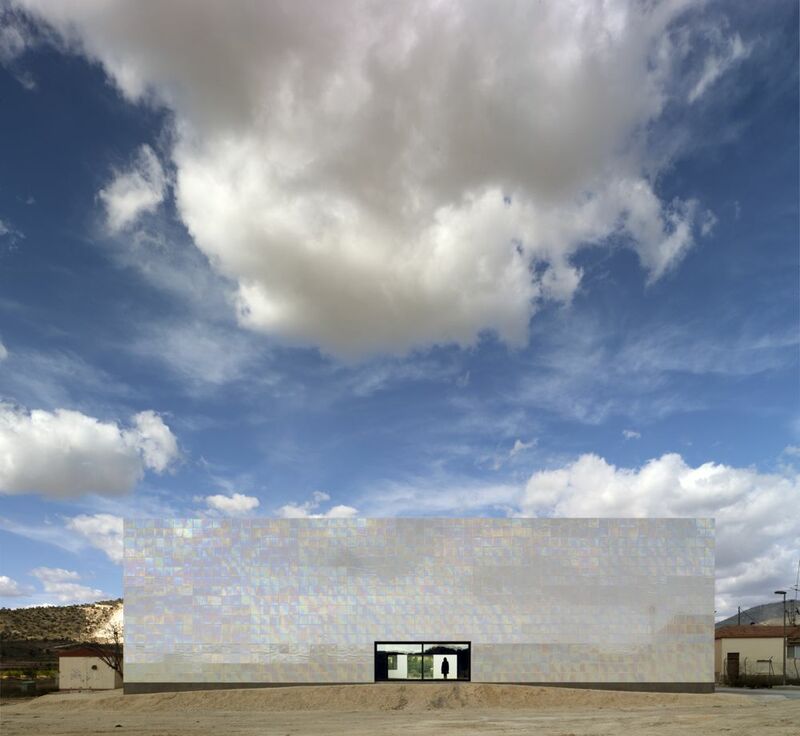 Politicians demanded the generation of a building that could be used as a brand, able to arise as a recognizable landmark in the village, where doesn’t exist any exempt contemporary building able to act as a brand. The generation of this recognizable landmark, architecturally speaking, usually has to do with expensive budgets, amazing materials and sculptured shapes. 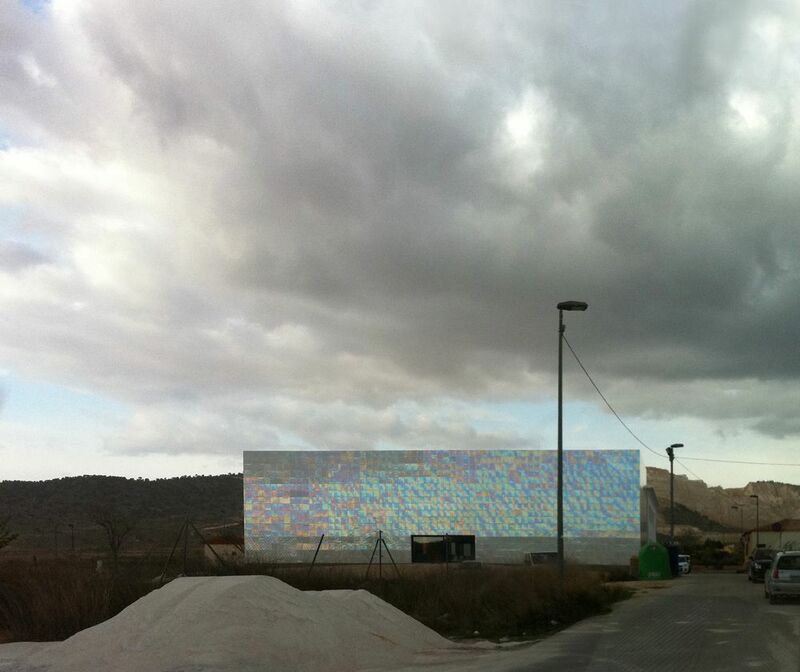 However, this project generates this landmark with a low cost solution relying on two concepts, one concerns “psychology of perception” and uses vibration and brightness, and the other concerns shape and uses the rotund appearance with proportions similar to its industrial landscape. Brand architecture is used in big cities to offer a recognizable image that can be easily remembered and associated to a city and its values. Using this kind of marketing at village level has to be reflected, because they only need a building for a determinate program. Here it allows starting sketching a strategy to reactivate the exterior image of the village, and helping strengthen it for the imminent economical change it’s immersed. 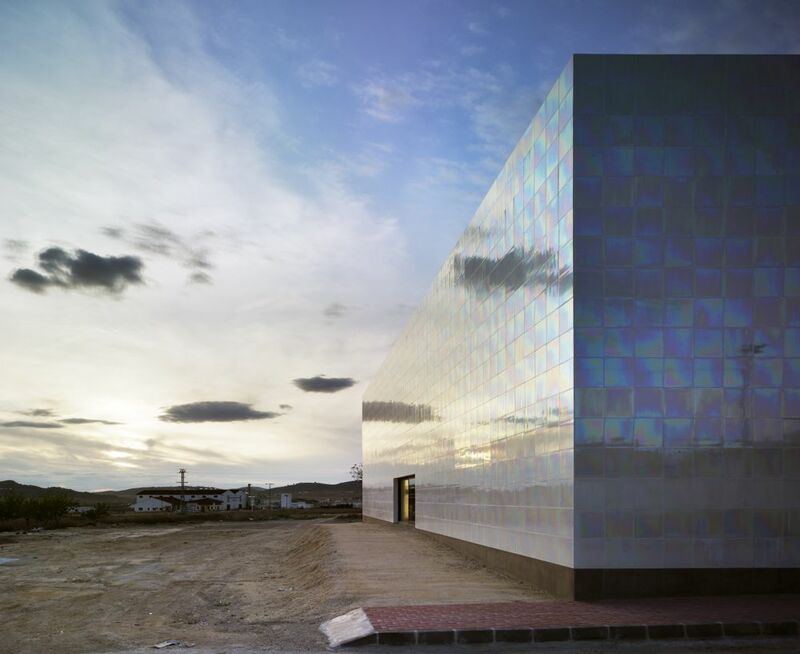 The use of a ceramic surfacing with pearly and iridescent finishing responds the intention of generating a vibrant volume in constant change, due to lighting changes o observatory movements, this solution makes the building vibrate, changing its colour, saturation and profundity. 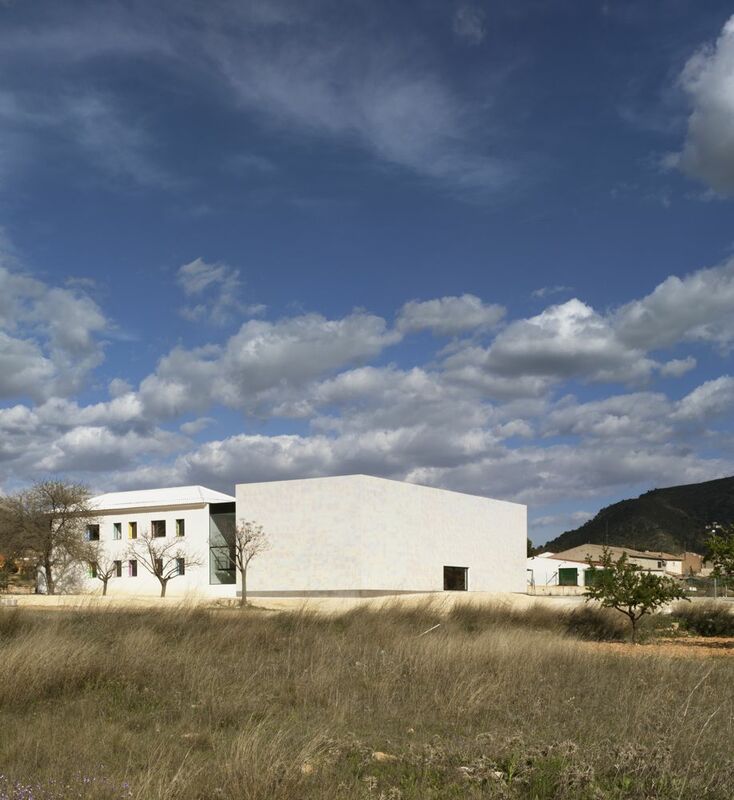 The bet on this material, made “exnovo” for this building, with the use of existing techniques of firing, vitrifying and metals deposition, give this appearance and respond to the necessity of not creating a tectonic or shape solution, but a perceptive one. 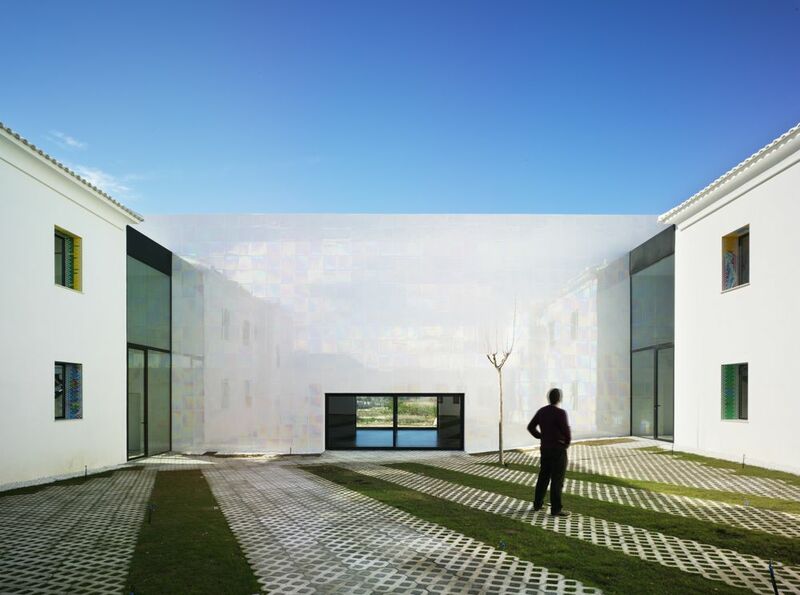 This technique is based on a porcelain base material that resists frost and is guaranteed in exterior. Each of these plates is pressed in dry and is fired 3 times: first of them at 950ºC to biscuit it, second to fire the white enamel and vitrifying the biscuit at 1180ºC in rapid cicle, and third that obtains the iridescent-pearly finishing or the metal reflections at 780ºC approximately. 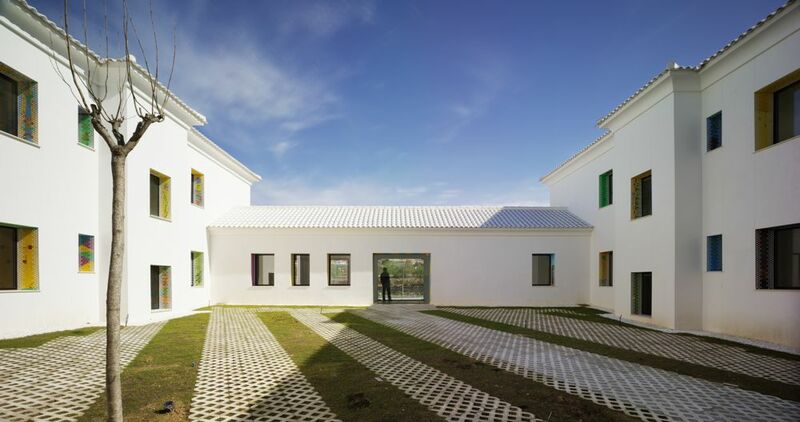 The opportunity of the project is the creation of an architectural program audited with the village. For many years music is an important part of the culture in Algueña. This building is the opportunity to bring together in a same space all the activities that are spread through the village. The program departs form music realm and we lead it to a more indeterminate situation, linked to multipurpose uses. 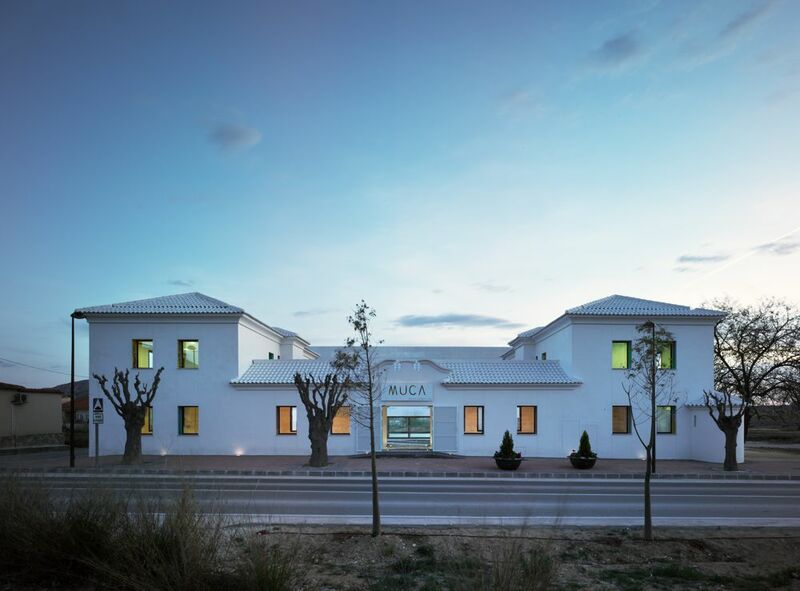 After doing the work of defining the architectural programs, that we developed in multiple meetings with different agents and citizens, the building houses a wide range of activities form music lessons, rehearsals and concerts of the municipal music band, the “rondalla” and choir, lessons and performances of the regional dance group, the “dolçaina and tabalet” group, rock bands, composition workshops and electronic music lessons; to exhibition rooms, conference rooms, assembly rooms, place to hold popular feasts, and even a municipal warehouse. The music as social enhancer in a village. Music bands are a great valencian tradition because in almost every village and town it exists at least one of these musical groups. The musical quality of these bands is recognized around the world, some of them reaching more than 125 members. These groups are not only cultural entities but also social, with a high degree of participation in the village that goes far beyond the music and concerns social integration, formation and group work. Algueña’s band is a good example of this. Each event or concert, and even the rehearsals are followed by the people; not only the results (concerts) are appreciated but also the process (rehearsals, auditions, lessons, meetings) are shared. As an example: as they have few cultural events, people assists to weekly rehearsals of the band. As a result, in the Comunidad Valenciana exists a network of bands and music centers that are the birthplace of internationally prestigious musicians. This encouraged the creation in 1968 of the Musical Societies Federation of the Comunidad Valenciana. Its aim is to promote and spread the love, teaching and practice of music and enhancing associationism and allowing society a mean of cultural development. In Europe, the Comunidad Valenciana is the region where more music bands exist with Austria and Holland. The historical marc of the building. Working with collective memories. 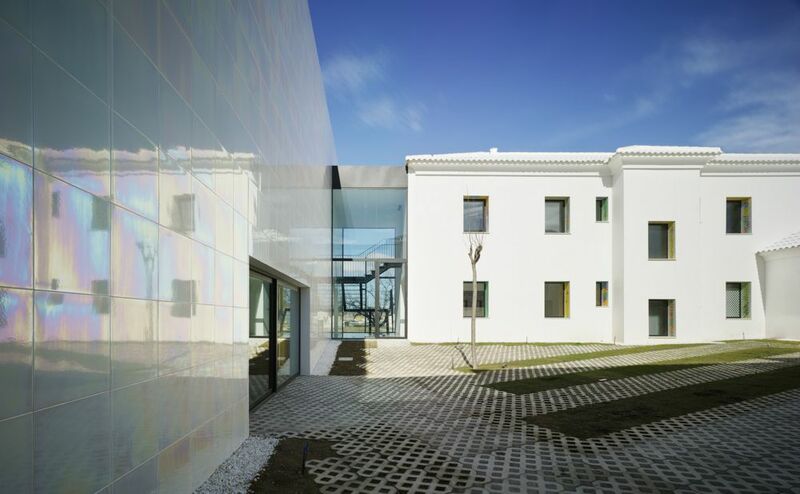 When you decide to work in an existing building with a profound historical mark, so profound as can be in a Guardia Civil quarter and checkpoint, it’s commonly assumed that one of the challenges of the project will be erasing that historical mark. 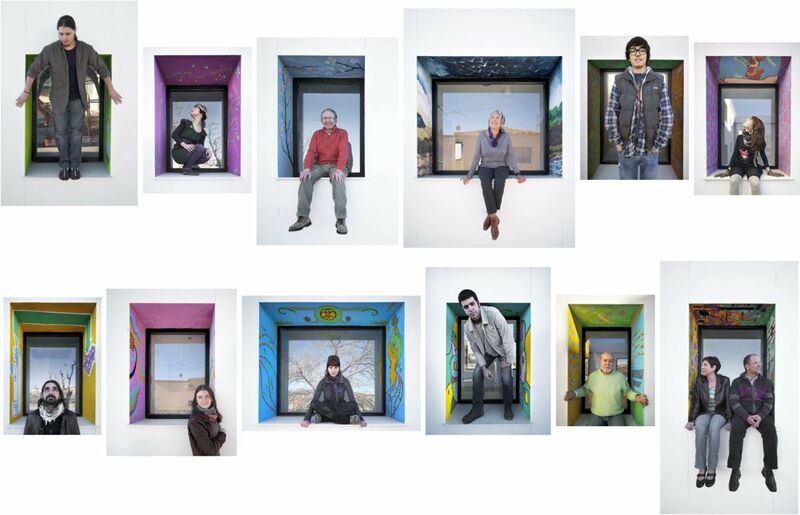 To do so we developed with the Art Agency “La Ballena Imantada”, directed by Luisa Martí, a social and artistic event in the building: “60 glances” whose objective was to take 60 artists paint during a day each one of the jambs and lintels of the doors and windows. We generated a “transcendent social act” that brought together more than 500 people around the building among artists, musicians, spectators, familiars,.. allowing us to show the building while still in construction and start to weave a consensus atmosphere between the citizenship, detaching authorship and leave the building up to its future users. This work concerning sociology and anthropology is vital in this project to provoke a shift in the collective memories.